Fall / Winter Rainbow & Lake Trout bite is On! Been having some solid fishing up here on our Lake Tahoe fishing trips with both Lake Trout (aka Mackinaw) and Rainbow Trout on the bite! The Lake Trout bite has been very consistent in the morning at the crack of dawn. Limits have been the rule on our Lake Tahoe fishing charters with Lakers up to nearly 10 lbs being taken slow trolling my special spoons in 300 - 450 ft of water. As far as the Rainbows go the shallow water topline bite has been solid. Been getting most of the fish on the Indilure Abalone "Goldfish" 9 CM spoons, along with Rapala jointed scatter raps. Whether fishing them in the early AM, or after the Lake Trout bite or hitting them in the afternoon we've been getting 3 - 5 fish per hour ranging from 1 - 6 lbs. So go fish and fish hard with Sierra Fin Addicts! Call and book your Lake Tahoe fishing adventure today! Spring Lake Trout Bite is On! The bite on our Lake Tahoe fishing trips this past few weeks remains good to very good for Lake Trout aka Mackinaw and also a sprinkling of nice Brown & Rainbow Trout! The morning Mackinaw bite continues to be very steady (easy limits) trolling in deep 300' - 400' of water. Many of these fish have been in the 3 - 7 lb range with a few larger (up to 10 lbs) and smaller ones mixed in. The afternoon bite for the Macks has been a bit slower of late. These fish aren't quite as large as the ones we've been getting on the AM trips. Though, this can change from day to day. There are many afternoons at this time of year where the bite can be equally as good if not better than the morning bite. A lot of times it just depends on the weather (wind) allowing you to get out. Up in the shallows we've been finding a few nice Rainbow & Brown Trout! Toplining both spoons, plugs, and live minnows pulled behind dodgers & flashers has been the game here. Not uncommon right now to catch both Browns & Rainbows along with Mackinaw on a 1/2 day charter! Ready for that fish’n fix? Come fish with us, Sierra Fin Addicts - Lake Tahoe Fishing Charters! Great mid-spring Lake Trout bite is on!! 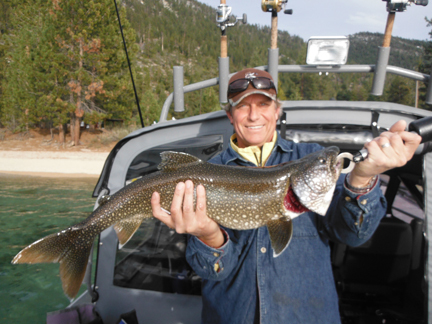 Great Lake Trout aka Mackinaw fishing with 10 - 20 fish days on our Lake Tahoe fishing trips trolling deep (bouncing bottom in 350' - 450' of water) with lures for fish ranging from 3 - 8 lbs. With the record breaking winter we've had this season the water is still very cold for this time of year making fishing the shallows very tough. Most of our efforts have been going deep for the Lakers so not much to report on the Rainbow & Brown Trout front. Spring bite is good for our Lake Tahoe fishing charters! The bite on our Lake Tahoe fishing trips this past few weeks remains good to very good for Lake Trout aka Mackinaw and also a sprinkling of nice Lake Tahoe Brown & Rainbow Trout! Brown & Lake Trout Spring Bite is On! We've definitely been experiencing some very nice spring like weather here on our Lake Tahoe fishing trips with air temps hitting the mid 60's & the fish hitting as well! Over the past few weeks we've been doing very well on Lake Trout (aka Mackinaw) with hit and miss success in the shallows for Brown, Rainbow, & Lake Trout. The deep water Lake Trout bite has been good to very good with limits the rule with some cases in just a couple hours of fishing. The fish have mostly been in the 3 - 8 lb range and have been taken trolling in 300 - 400 ft of water. As far as the shallow water toplining bite goes it seems that if you can find a day where you have some cloud cover or a wind chop your odds of getting into some Brown and Rainbow Trout are much better. When these fish have been biting on our Lake Tahoe fishing trips we've been getting them toplining (trolling up to 400' back) with stick baits (Rapalas, Thunderstix), but have been getting the majority of these fish on my favorite Indilure Goldfish spoon. I have a feeling that with warmer days in the forecast the shallow water bite should just get better and better. Also, for weekly Lake Tahoe fishing reports, current photos, and specials please check out our Facebook page. So go fish and fish hard! Preferably with us, Sierra Fin Addicts! Call and book your Lake Tahoe fishing adventure today! Lake Tahoe Winter bite is on! With the lack of snow up here in Tahoe I've been getting alot of calls from people wanting get out on one of our Tahoe fishing trips, and they have not been disappointed! The action has been good to very good on Lake Trout "aka Mackinaw" both trolling deep with spoons and shallow with spoons as well along with Rapala Scatter Raps and larger plugs / swim baits. The fish have been coming in all sizes, though this past week we got 4 fish over 10 lbs with one weighing in at around 18 lbs and another at 15 lbs. Pretty much can catch fish throughout the day right now with both AM & PM trips producing. Along with the Mackinaw we have also been catching a few nice sized Rainbows as well on the topline troll. 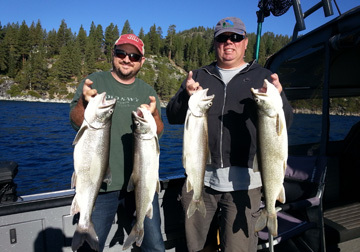 Fall bite continues for our Lake Tahoe fishing charters! Been having some solid fishing up here on our Lake Tahoe fishing charters with both Lake Trout (aka Mackinaw) and Rainbow Trout on the bite! The Lake Trout bite has been very consistent every morning at the crack of dawn. Limits have been the rule on our Lake Tahoe fishing charters with Lakers up to nearly 10 lbs being taken slow trolling my special spoons in 150 ft all the way out to 400 ft of water. We've had amazing weather this Fall to aid this bite and it looks like both will continue for now! As far as the Rainbows go the shallow water topline troll (Indilure Spoons & Rapalas) and live bait bite has been solid of late. Whether fishing them after the early AM Lake Trout bite or hitting them in the afternoon we've been getting 3 - 5 fish per hour ranging from 1 - 6 lbs. 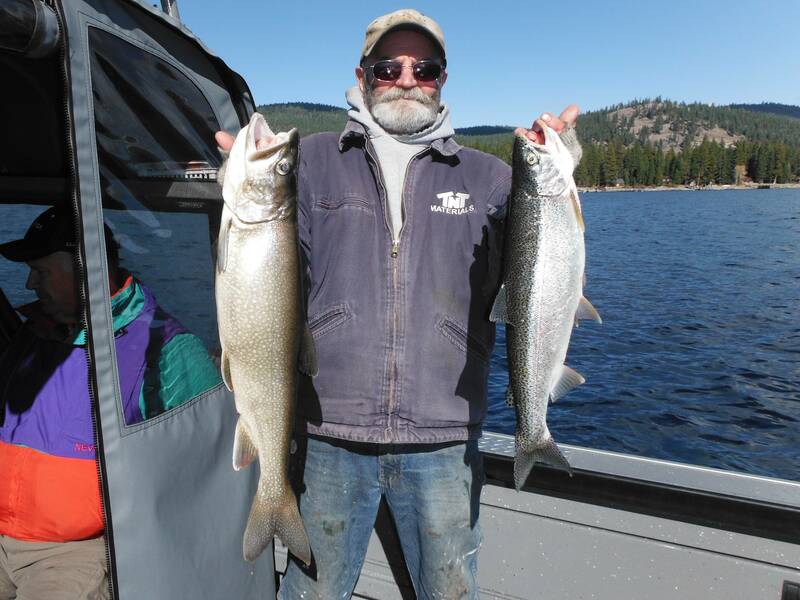 I will be posting a few of the nicer sized fish on my Facebook Tahoe fish report page shortly. With the cooler evening temps this bite will stay strong if not even better with more and more larger fish mixed in. Fall bite is on for our Lake Tahoe Fishing Trips! Summer bite is on for our Lake Tahoe fishing charters! 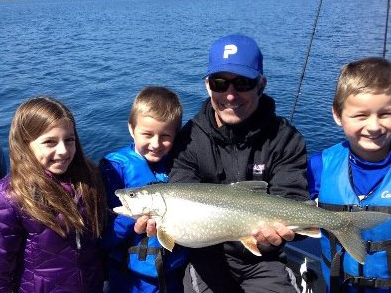 We've been experiencing good - very good Lake Trout aka Mackinaw fishing on our Lake Tahoe fishing trips this past couple of weeks, which has been our main focus with the warmer summer like conditions settling in! We've pretty much given up on the shallow water bite with nice 3 - 7 lb Lake Trout taking over the action. Trolling 300' - 400' down with our special spoons right off the bottom has been the ticket with limit style action on our AM trips and with the smaller ones being released to fight another day! We've also been getting fish on our afternoon trips, but they have been falling into the 2 - 5 lb range. These fish have also been taken trolling & jigging at times. 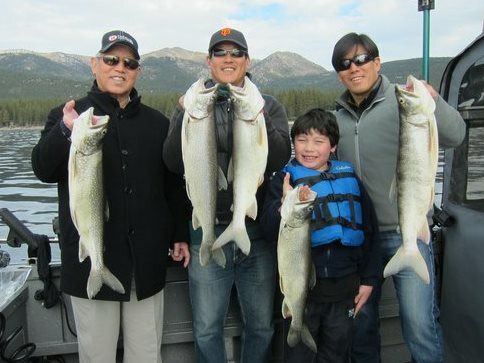 Spring bite fair to good for our Lake Tahoe fishing charters! The bite on our Lake Tahoe fishing trips this past couple of weeks has been fair to good for Lake Trout aka Mackinaw and also a sprinkling of Lake Tahoe Brown & Rainbow Trout! Got to be honest here, but the deep water Lake Trout bite has been tough at times for our AM & PM trips. This has been the scenario since the last full moon. Instead of one stop shop we've had to hunt around and hit several spots to put together a catch. One day they'll want to bite early the next not so much! Same goes for the afternoon. Though experience and being persistent has put fish in the boat. I'm betting that the bite will get back to normal here within a few day of this report being written. Up in the shallows we've been finding the Rainbow & Brown Trout to be behaving the same as the Lake Trout. Toplining both spoons, plugs, and live minnows pulled behind dodgers & flashers has been getting a few fish here, but also with no consistency! We're expecting warming temps here this next week meaning water temps rising and hopefully the bite along with it. Winter bite continues for our Lake Tahoe fishing charters! The bite on our Lake Tahoe fishing trips this past few weeks remains very good for Lake Trout aka Mackinaw and also a sprinkling of nice Lake Tahoe Brown & Rainbow Trout! The morning Mackinaw bite continues to be very steady (easy limits) trolling in deep 300' - 400' of water. Many of these fish have been in the 5 - 8 lb range with a few larger and smaller ones mixed in. The afternoon bite has been equally as good if not better at times weather permitting. These fish aren't quite as large as the ones we've been getting on the AM trips though we got a really nice one the other afternoon. Shawn Gray and family took a break from skiing to try their luck on some Lake Tahoe fishing action and they were rewarded with a bunch of Lakers along with a 19 lb beast (shown in picture)! Good going Shawn and thanks for releasing her unharmed to fight another day! Winter Bite Is On For Our Lake Tahoe Fishing Charters! The bite on our Lake Tahoe fishing trips this past few weeks (we've had great non-winter like weather here) has been very good for Lake Trout aka Mackinaw and also a sprinkling of nice Rainbows & Browns! I was out our nearly every day over the Holidays hitting the Lake Trout deep (300' - 400' of water) slow trolling spoons right off the bottom. Many of these fish were in the 5 - 8 lb range with a few larger and smaller ones. This bite still continues as of today, Jan. 14th! Along with getting them deep we've been getting some Lakers in the shallows toplining spoons and plugs. Also, up in the shallows we've been finding a few nice Rainbow & Brown Trout! Toplining both spoons, plugs, and live minnows pulled behind dodgers & flashers has been the game here. Not uncommon right now to catch both Browns & Rainbows along with the Mackinaw on a 1/2 day charter! Lake Tahoe Mackinaw & Rainbow Bite Very Good! The bite on Lake Tahoe this past few weeks (weather permitting) had been very good for both Mackinaw & Rainbow Trout! Had a 7 day run where I hit the Lakers aka Mackinaw deep for 10 - 15 fish every morning. Many of these fish were in the 4 - 8 lb range with a few larger and smaller ones. These fish where taken both jigging and trolling in 180 - 400' of water tight to the bottom. Though, on a few of our Lake Tahoe fishing charters we connected with some nice sized Mackinaw in the shallows (25 - 40' of water) toplining both swim baits & live minnows. We nailed one that was approx 17 lbs that took a live minnow on 6# leader. It is the fish highlighted in the report photograph. This fish was released to fight another day! Also, been getting some nice sized Rainbows toplining in the shallows as well. Been getting them on both slow trolled minnows along with faster trolled Indilure Goldfish spoons. This Fall has been one of the better seasons that I've seen for quality Rainbow trout. I've posted quite a few pictures of these fish on my facebook page - Sierra Fin Addicts. Lake Tahoe Rainbow & Lake Trout Bite Is On! Been getting into both Rainbow Trout & Lake Trout aka Mackinaw on our Lake Tahoe Fishing Trips. The shallow water Rainbow Trout bite has been pretty consistent especially on days where you have a little wind chop on the water breaking up the surface tension. Been toplining minnows behind dodgers & flashers, spoons, & rapala type lures. The fish have been ranging from 1 - 5 lbs with a few larger ones thrown in. As far as the Mackinaw bite goes they've been out in deeps 180 - 350' of water, but have also been nailing a few nice ones toplining in the shallow (25 - 40' of water). Most these fish have been ranging from 2 - 7 lbs. 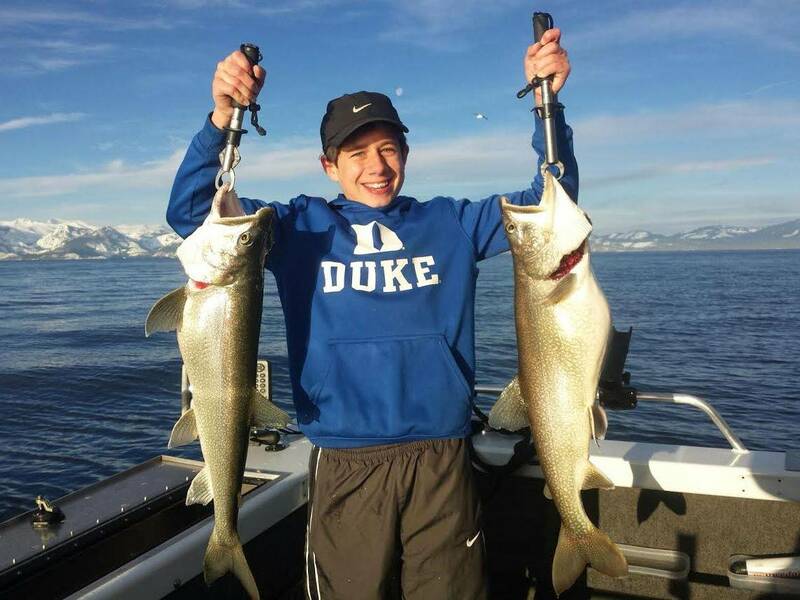 Quality Mackinaw Biting For Our Lake Tahoe Fishing Charters! 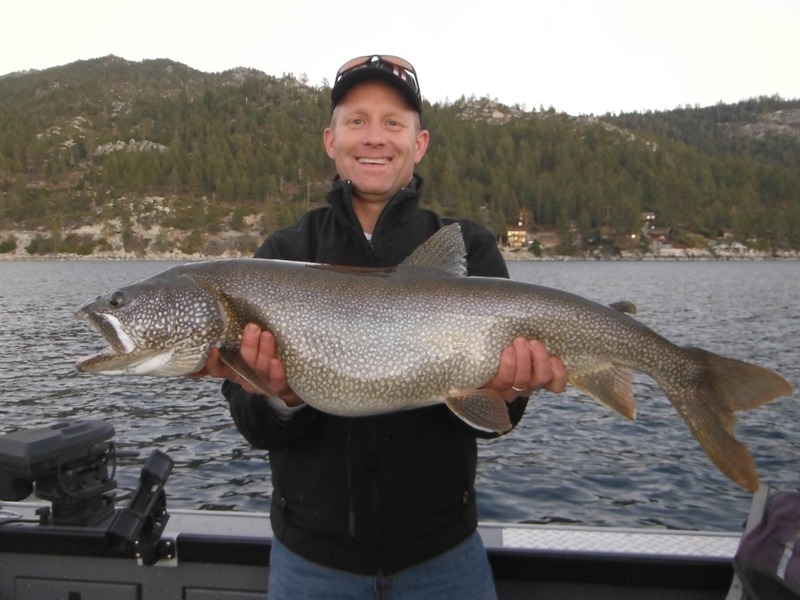 Quality, 5 - 6 lb avg, Lake Trout (aka Mackinaw) have been biting for our Lake Tahoe AM fishing trips! On our AM trips we’ve been catching mostly 4 – 9 lb fish trolling super deep in 300 - 400 ft of water with customized spoons. Limits have not been the rule, but the quality and size of the fish have made up for it! On our afternoon trips we’ve been getting Macks as well, but these fish have been more in the 2 -5 lb range with limits or near limits taken. We’ve also been getting into some Rainbows in the afternoons and early evenings, but nothing to brag about as far as size, but good action! Also, for more current Lake Tahoe fish reports and photos check us out on Facebook at Sierra Fin Addicts. Ready for a fish’n fix? 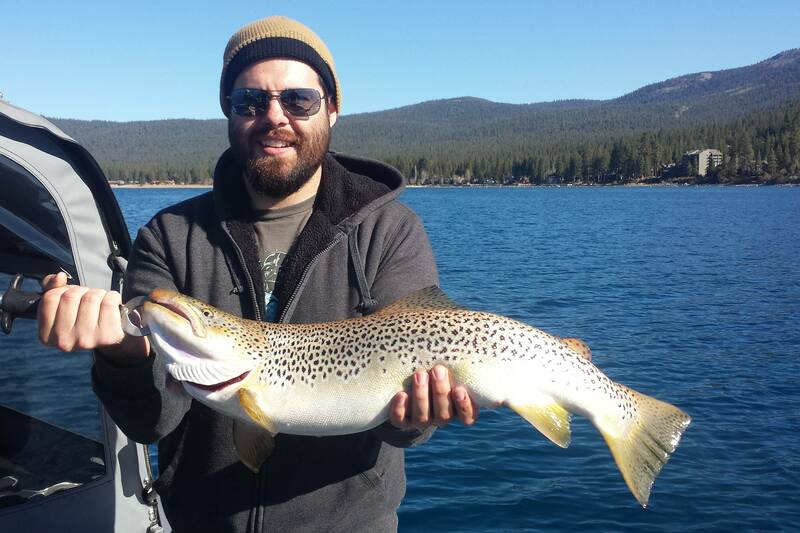 Come fish with us, Sierra Fin Addicts - Lake Tahoe Fishing Charters! Mackinaw Bite Is On For Our Lake Tahoe Fishing Charters! The Laker (aka Mackinaw) bite has been on for our Lake Tahoe fishing trips! On our AM trips limits of 3 - 8 lb fish has been the norm trolling super deep in 300 - 400 ft of water with customized spoons. I have 500 ft of 200# braid on my down riggers now just so I can get down and fish effectively for these fish. Limits have also been taken on our afternoon trips as well, but these fish have been more in the 2 - 5 lb range. Been trolling and jigging a little shallower for these fish in 170 - 220 ft of water. Also, for more current Lake Tahoe fish reports and photos check us out on Facebook at Sierra Fin Addict. If you ready for the fish'n fix. Come fish with us, Sierra Fin Addicts - Lake Tahoe Fishing Charters! 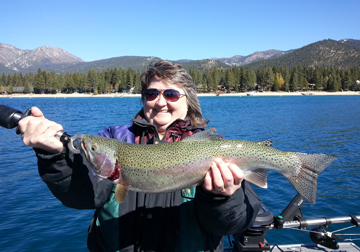 Mackinaw & Rainbows Are Biting For Our Lake Tahoe Fishing Charters! Been doing well of late fishing deep for Lake Trout (aka Mackinaw) and shallow for Rainbows on our Lake Tahoe fishing trips. The Mackinaw bite has been good for both our AM & PM trips. Trolling deep with Indilure and other customized spoons has been the trick for 3 - 8 lb fish with counts ranging from 6 - 12 fish per outing. On nicer (calmer) afternoons the jig bite has also been paying off for Lakers. As far as the shallows go the Brown Trout bite has been fair at best for us, but have been doing well on the Rainbows slow trolling with live minnows and crawlers. Been averaging anywhere from 6 - 10 Rainbows per attempt. On one recent afternoon trip we landed 10 Rainbows within 2 1/2 hrs and then hit the Lakers deep for 7 more fish! Also, for more current Lake Tahoe fish reports and photos check us out on Facebook. Are you you ready for that fish'n fix? 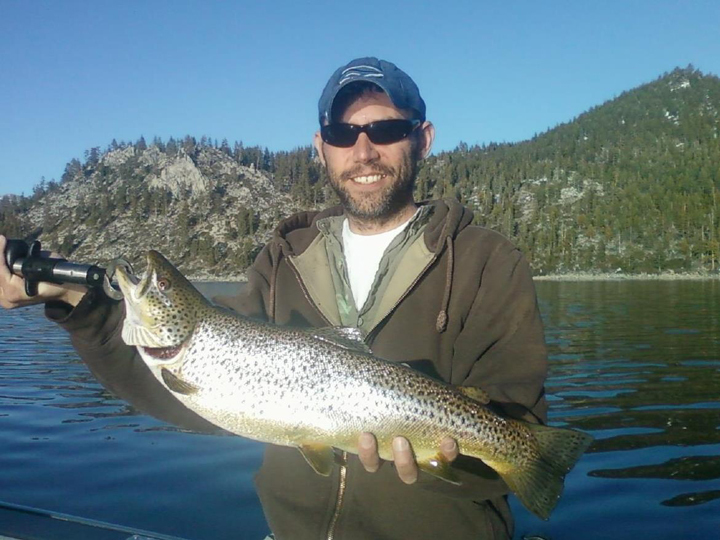 Come fish with us, Sierra Fin Addicts - Lake Tahoe fishing charters! Toplining Bite Improving For Our Lake Tahoe Fishing Charters! A mild winter and above average temps has sparked some spring like action on our Lake Tahoe fishing trips. With warmer water temps the shallow water bite is slowing turning on here with a mix of Browns, Rainbows, and Lake Trout (aka Mackinaw) being taken toplining live bait, spoons, & plugs. Most of the trout taken of late have been in the 1-6 lb range. Some days definitely better then others, but with a little more warming up here the bite will only get better and more consistent. We've also been trolling and jigging deep, 180 ft +, for Mackinaw. The deep water bite has been fair to good with most of the fish in the 2-5 lb range. Lately on our 1/2 day Tahoe fishing charters we've been splitting the time fishing both deep and shallow to try get into a good mix of fish and action. Are you ready for that fish'n fix? Come fish with us, Sierra Fin Addicts - Lake Tahoe fishing charters! Good Winter Mackinaw Action For Our Lake Tahoe Fishing Charters! Been doing Tahoe fishing trips here and there this winter with good results on Lake Trout (aka Mackinaw). Been getting most of the action trolling modified spoons and / or jigging deep in 200 ft + of water. Most these fish have been running 3 - 8 lbs with a few larger ones mixed in. We've also been getting a few topline trolling the shallows, which is always a fun way of gettin'm. Here in the shallows we've also been seeing a few nice Rainbows coming in as well on slow trolled minnows & night crawlers. 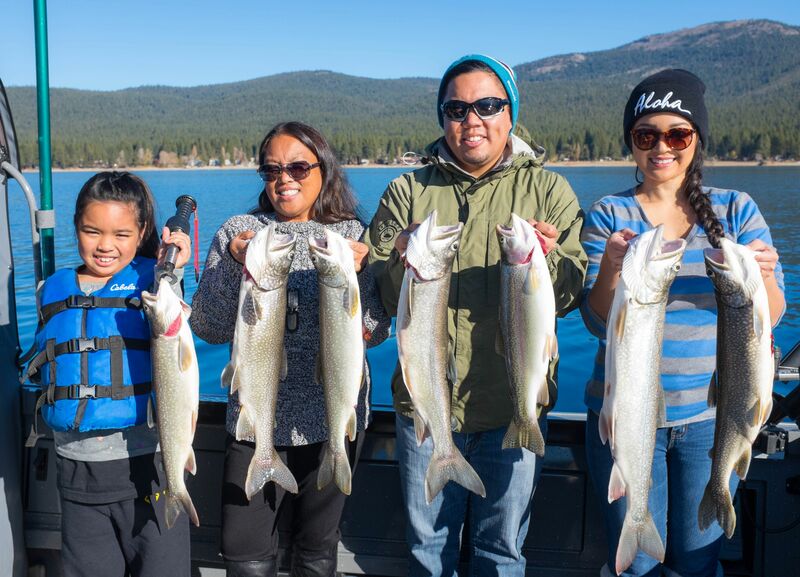 Fall Lake & Rainbow Trout Bite Is On For Our Lake Tahoe Fishing Charters! The Lake Trout bite has been very consistent every morning at the crack of dawn. Limits have been the rule on our Lake Tahoe fishing charters with Lakers up to nearly 10 lbs being taken slow trolling my special spoons in 170 ft all the way out to 350 ft of water. We've had amazing weather this Fall to aid this bite and I'm hoping that both continue! As far as the Rainbows go the shallow water live bait topline bite has been solid on our Tahoe fishing trips. Whether fishing them after the early AM Lake Trout bite or hitting them in the afternoon we've been getting 3 - 5 fish per hour ranging from 1 - 6 lbs. I will be posting a few of the nicer sized fish on my facebook Tahoe fish report page shortly. With the cooler evening temps this bite will stay strong if not even better with more and more larger fish mixed in. Pre Summer Lake Tahoe Fishing Bite! Well, we've pretty much hung up the shallow water Rainbow & Brown Trout toplining gear and our Lake Tahoe fishing charters have mainly been focusing on Lake Trout (aka Mackinaw). The Mackinaw bite has definitely not been wide open for our Lake Tahoe fishing charters of late where one day we're just scratching out our limits and the next day they decide to bite good! Our Lake Tahoe fishing guides mostly have been putting clients on fish trolling a variety of spoons and flatfish along with some good jigging action here and there. Most all the fish half been taken in 160 - 240 ft of water with bigger fish just hitting the double digit mark. I have a feeling with the high pressure building that the bite should become more consistent here in the near future. So go fish and fish hard with Sierra Fin Addicts. Call and book your Lake Tahoe fishing charter today! Tahoe Spring Bite On For Our Lake Tahoe Fishing Charters! We've definitely been experiencing some very nice spring like weather here on our Lake Tahoe fishing trips with air temps hitting the 70's & the fish hitting as well! Over the past few weeks we've been doing very well on Lake Trout (aka Mackinaw) with hit and miss success in the shallows for Brown, Rainbow, & Lake Trout. The deep water Lake Trout bite has been good to very good with limits the rule, but with many days where we're getting up to 4, 5 even 6 fish per angler in just a couple hours of fishing. The fish have mostly been in the 3 - 7 lb range and have been taken jigging and trolling in 190 - 260 ft of water. Our Lake Tahoe fishing guides have discovered a new trolling spoon made by a Swiss Co. called Indilure, which has absolutely been knocking them dead! As far as the shallow water toplining bite goes it seems that if you can find a day where you have some cloud cover or a wind chop your odds of getting into some Brown and Rainbow Trout are much better. When these fish have been biting on our Lake Tahoe fishing trips we've been getting them toplining (trolling up to 400' back) with stick baits (Rapalas, Thunderstiks, Bombers, etc. ), but have been getting the majority of these fish on a new hot spoon made also by Indilure. I have a feeling that since the recent heat wave is over and cooler temps are forecasted the shallow water Lake Tahoe fishing bite will pick up and become more consistent. Spring Bite Has Arrived For Our Lake Tahoe Fishing Trips! Have definitely been fighting the weather of late on our Lake Tahoe fishing trips with winter like storms rolling thru the area one after another! But, the good new is that the Tahoe fishing, both shallow & deep, has been good when the winds have been down between these weather systems. As far as the deep water bite goes we've been slow trolling spoons & flatfish, and vertical jigging in 180 - 240 ft for mostly limits of Lake Trout (aka Mackinaw) that have been ranging from 3 - 7 lbs with a few largers taken here and there. As far as the shallows go the water temp is still down in the lower 40's, but that hasn't kept the Brown, Rainbow, & Lake Trout from biting toplined plugs & spoons on our Lake Tahoe fishing charters. I've had a mixture of these fish on my last few trips with the fish count being anywhere from 6 - 10. Yesterday on a Tahoe fishing trip I had Greg McManus out for some toplining action where we netted 6 Browns and a Lake Trout and even lost a couple. One of which was most likely a larger model Brown Trout by the way it fought. We'll get'em next time Greg! So go fish & fish hard! Preferable with us, Sierra Fin Addicts! Call and book your Lake Tahoe fishing charter today! No Snow + Beatiful Weather = Great Tahoe Fishing! It is Winter up here on Lake Tahoe, but mother nature must not of been informed of this. We have no snow here with beautiful Fall like days with temps reaching into the 50's. This has all equated to excellent Lake Trout (aka Mackinaw) fishing on our Lake Tahoe fishing charters! I've been out nearly on a daily basis with clients that came to the area to find no snow that wanted to salvage there vacation with a exciting outdoor activity. On our Lake Tahoe fishing trips the Mackinaw definitely added the excitement with 12 - 25 fish per 1/2 day trip ranging anywhere from 2 - 10 lbs. They've been taken both by trolling and jigging lures in 160 - 240 ft of water. The Lake Tahoe fishing bite has just been outstanding! With the extended weather forecast still showing no snow with light winds I have a feeling there's plenty more of this to come. Go fish and fish hard with Sierra Fin Addicts! Call and book your Lake Tahoe fishing adventure today! Fall Shallow Water Bite Is On For Our Lake Tahoe Fishing Trips! Cooling water temps, dropping down into lower 50's, have sparked the shallow water bite for our Lake Tahoe fishing charters. Rainbows, Mackinaw, and a sprinkling of both Browns and the newly planted Cutthroats have all been taken of late. Our Lake Tahoe fishing trips have seen Rainbows, Browns, & Cutthroats that have all been taken toplinig live baits and plugs on long setbacks in 15 - 40 ft of water. Most of the fish have been in the 1 - 4 lb range with some the bigger ones up to the 6 lb class. The Lake Trout (aka Mackinaw) fishing has also been solid with easy limits coming from 160 - 220 ft of water on both jigs and trolled lures. These fish have mainly been running in the 2 - 7 lb range, but there have also been some larger fish taken in the shallows up to 15 lbs. Check back soon for more Lake Tahoe fishing reports. Go fish and fish hard with Sierra Fin Addicts! Call and book your Lake Tahoe fishing charter today! Late Summmer Bite Is On For Our Lake Tahoe Fishing Charters! The Lake Trout (aka Mackinaw) bite has really picked up in the past few days on our Lake Tahoe fishing charters with quick limits coming in the early morning hours. The fish have been in the 3 - 8 lb range with a larger one showing up here and there! The fish have still been mostly taken in depths ranging from 160 - 220 ft on jigs and trolled lures. As far as the shallows go they should start picking up soon with the Fall nearing, which means cooler water temps and Rainbow Trout hitting the shallows to feed. For more updated Lake Tahoe fishing reports and photos please check us out on Facebook. The link is on the upper right corner of this website. Go fish and fish hard with Sierra Fin Addicts! Call and book your Lake Tahoe fishing charter today! 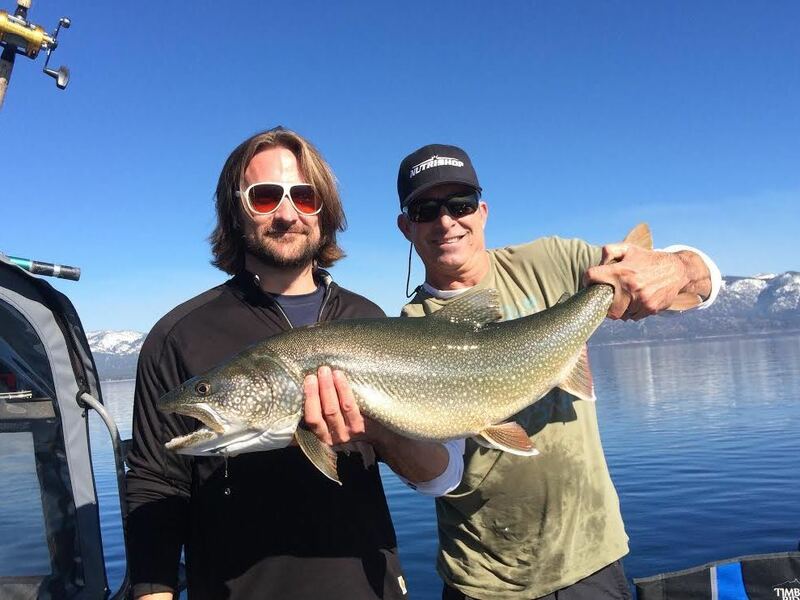 Our Lake Tahoe Fishing Charters See Strong Bite With Spring Like Conditions! 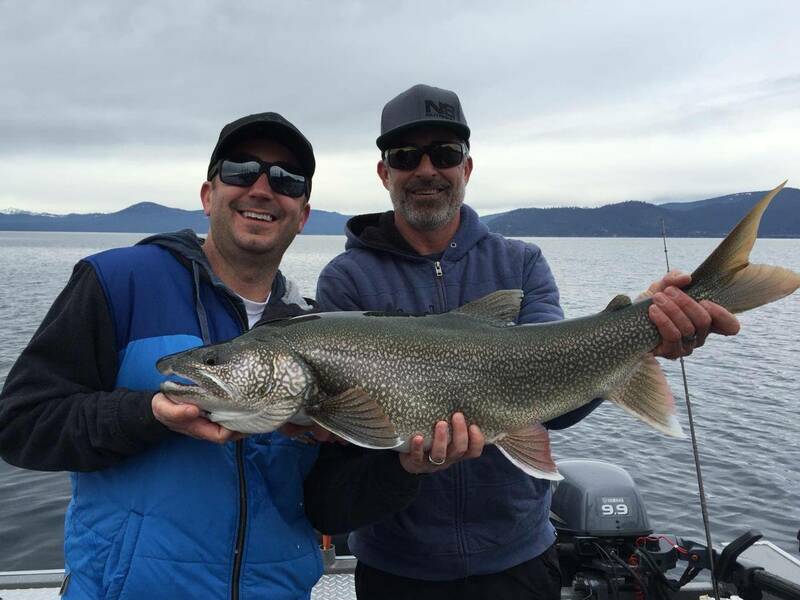 The Mackinaw (aka Lake Trout) bite continues to be good to very good on our Lake Tahoe fishing trips with 12 - 22 fish outings the norm ranging from 2 - 8 lbs with an occasional larger model thrown in here and there. The fish have still been mostly taken in depths ranging from 160 - 220 ft on jigs and trolled lures. As far as the shallow water bite goes we're hoping that it may finally get going here for Browns, Rainbows, and larger Mackinaw. It snowed here just up to a few days ago and the water temp is still down around 48 degrees as of today, but with warmer days and high pressure forecasted the water temps will start rising and hopefully the shallow bite along with it. For more updated Lake Tahoe fishing reports and photos please check us out on Facebook. The link is on the upper right corner of this website. Go fish and fish hard!! Spring Lake Tahoe Fishing Charters Connecting Deep With The Shallow Water Bite Just Getting Going! Been having 12 - 20 fish (Lake Trout aka Mackinaw) days on our Lake Tahoe fishing trips trolling semi deep with lures, live bait, along with vertical jigging techniques for fish ranging from 3 - 8 lbs. As far as the shallow water bite goes for both Rainbow & Brown Trout along with Mackinaw it is really just getting going. Our Lake Tahoe guides have been managing fish (Rainbows & Browns) in the shallows with every attempt, but this bite will only improve as the water starts warming. The temp is currently at 44 degrees, but with forecasts of warmer days to come the water temp will only rise, which will really get the shallow water bite going. May & June should be great months for hitting the shallows with light tackle and gear! Also, for those of you who are on Facebook please check out our page for more Lake Tahoe fishing reports, photos, and specials. Go fish and fish hard with Sierra Fin Addicts! Book your Lake Tahoe fishing charter today! 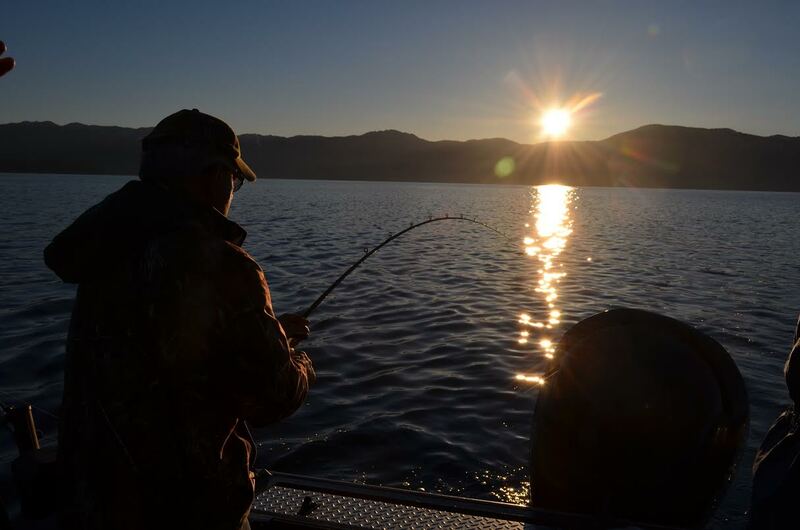 Lake Tahoe Fishing Trips See Spring Topline Action Come Alive! Our Lake Tahoe fishing charters have been making it out over the past few weeks whenever mother nature decides not to blow us off the lake. Though, getting a little to moderate wind, chop, rain, and/or snow has paid off big of late fishing Lake Tahoe. Even with the storms continuing to roll thru the area the lake temps have slowly been rising into the upper 40's, which has helped turn on the shallow water Lake Tahoe topline bite for both the Browns and the Macks along with a sprinkling of Rainbows. The majority of the Browns on our Lake Tahoe fishing charters have been in the 3 - 7 lb range and have been taken ripping plugs on a long 250 - 350 ft topline and slow trolling live minnows behind dodges and sidekicks in 15 - 35 ft of water. I have a feeling that with the full moon approaching later next week and with the forecasted weather report (more of mother nature) we may see a double digit Brown or two come out fishing Lake Tahoe. Larger Mackinaw have also made there shallow water debut of late, which has kept toplining larger plugs (Trophy Sticks, AC Plugs, Spro's BBZ Trout, etc.) very interesting and rewarding. Most of these fish are going 4 - 10 lbs., but had a couple larger fish at around the 14 - 16 lb range. As far as the Rainbows go I would rate the actions only as fair. Been getting a few here and there, but with really no consistency as of yet. Most fish have been taken slow trolling minnows and dodgers / flashers/ sidekicks, along with a few on the toplined plugs. Though this should change as the fish start coming back down from the rivers into the lake from there Spring spawning rituals. Also, an increase in water temp and presence of more minnows in the shallows should also help with the Rainbow bite. So come out and join me for a Lake Tahoe fishing trip! Lake Tahoe Fishing Trips See Spring Bite Shaping Up! After spending the last 4 months down in Mexico running a brand new 63 footer "Salty" and putting the hurt to 70 - 240# Yellowfin Tuna, or was it the Tuna putting the hurt to me?, I finally made it back home to Tahoe! I couldn't pull my boat out of storage fast enough and get it up to the lake where I had her up in running in no time flat in preparation for my weekend Lake Tahoe fishing charters. Had clients out the mornings of the 17th and 18th with good action on Mackinaw in both shallow and deep water using a variety of methods. Jigging in 150 - 180 ft of water produced well early with fish ranging from 3 - 5 lbs with one going nearly 12 lbs, which was caught by Joe Harney. Slow trolling Flatfish also produced fish in the the 3 -5 lb range in the same depths. The wind picked up pretty good on Sunday morning so we switched over to a faster troll up in the shallows with AC Plugs, which also paid off with fish up to 9 lbs. Also, gave the trout a shot in the shallows Saturday AM with live minnows and dodgers, sidekicks, flashers, etc. a couple smaller Rainbows and one Brown landed to 2 lbs. All and all not a bad weekend of fishing to kick off my Tahoe fishing season! Tahoe Fishing Bite Remains Strong With Spring Conditions Finally Here! 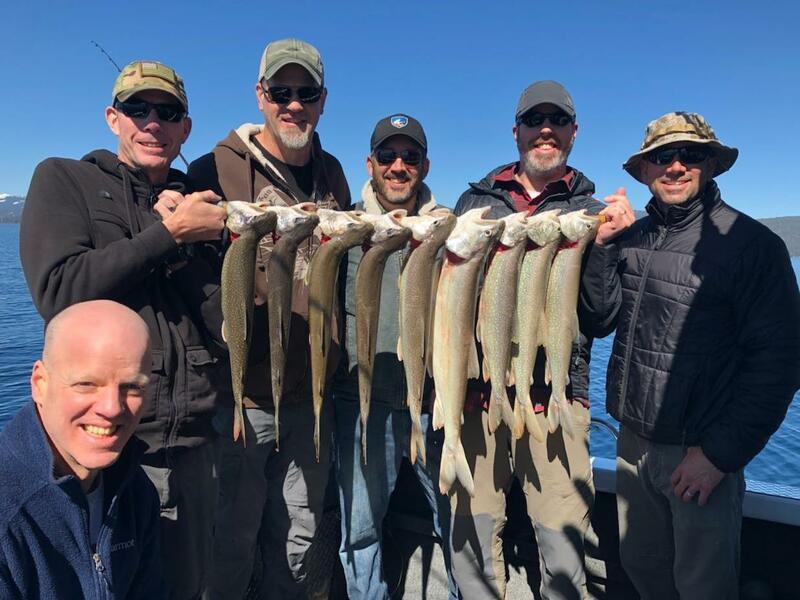 The Mackinaw (Lake Trout) bite has continued to be good to very good on our Lake Tahoe fishing charters with 12 - 20 fish outings the norm. These fish for the most part have been in the 2 - 8 lb range with an occasional larger one showing up. These fish have been taken mostly in depths from 160 - 220 ft on jigs and trolled lures. As far as the shallow water Lake Tahoe fishing bite goes it should really start picking up here. As of this Tahoe fishing report the water temp is still around 48 degrees, but with Winter finally stepping back and warmer days forecasted we should finally get into some more consistent shallow water fishing action for Browns, Rainbows, and larger Mackinaw. For even more updated Lake Tahoe fishing reports and photos please check us out on Facebook (link on top of the page). Go fish and fish hard with Sierra Fin Addicts! Book your Lake Tahoe fishing trip today!